My mom, Helen (Poh) Engel, grew up in Sturgeon Bay, Wisconsin. When she was in high school in the 1940s she decided she wanted a career. The main choices she saw available to her were to be a secretary, teacher, or nurse. When she was a junior in high school she decided to become a nurse. She speculated in later years that her choice have been influenced by her seamstress mother, who had spoken of having wanted that career herself. Mom was seventeen when she graduated from high school and knew that if she only took a three year program she would still have to wait a year to turn 21 to be able to be licensed. So she enrolled in the School of Nursing at Marquette University to earn her B.S. and become an R.N. Helen lived with Mick and Marion Wedewart, her aunt and uncle, in West Allis. Helen worked in the restaurant Mick and Marion operated on 84th & Beecher - LaPlante's Lunch - to pay for her tuition. It was here that she met her future husband, Russ Engel, who lived around the block. Helen and Russ started dating around 1943 but he enlisted in the US Marine Corps. He started basic training in October and then shipped out to the Pacific. In 1944 Helen enrolled in the U.S. Public Health Service's Cadet Nurse Program. The USPHS paid Helen's tuition ($110 per semester) and a stipend ($15 per month) in exchange for the obligation to serve for the duration of World War II. In Helen's case, her service was as a 2nd lieutenant nurse in the Army. 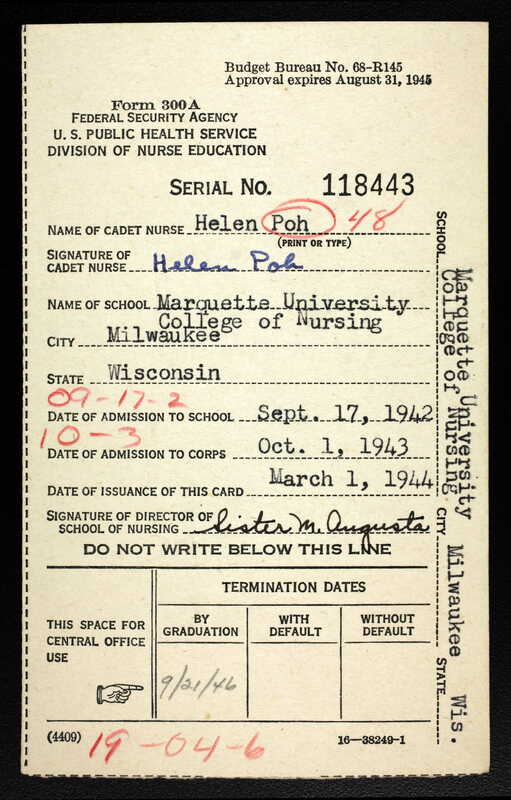 Helen graduated from Marquette with her Bachelor of Science degree in 1946, the year after the war ended, and was licensed as a Registered Nurse. to the first child. But that did not keep her out of the workforce. After the first child was born Helen resumed her career as an R.N., this time at St. Michael's Hospital in Milwaukee. Helen went on to have a total of 13 children, while juggling her career. little by the time I had my last two. But I still had to work right up to the end if I wanted to keep my benefits." Helen worked at St. Michael's for over 35 years. For a good portion of that she was a head nurse. In 1981 she looked back at the changes she had seen. "We were practicing team nursing when I first came here. But since I worked on 3-West, which was all private rooms, it was kind of like primary nursing all along to me." "We had an R.N., an L.P.N. and three nursing assistants on PM's on 3-Main then. Now I work with four other R.N. 's and two Nursing Assistants. That gives me time to teach patients. We couldn't do that before; we were too busy doing other things." "The whole nature of nursing has changed since I began working. Now we have in-service classes to teach us about new equipment and new techniques. We have floor meetings and support groups. And the whole nursing process is better. Nurses have more responsibility today than they ever did, and that's a big step ahead."